1. Cut the pineapple in half lengthwise, and scoop out the fruit. Cut the fruit into bite sized chunks. 2. In a large skillet, heat a tablespoon of oil, and fry the dry shrimp until crispy. Set it aside, and drain the skillet. 3. Add one more tablespoon of oil, and fry the garlic until its becomes golden brown. Turn to medium/high heat Add in the rice, and stir. 4. Add in the fish sauce and sugar; continue to stir for about a minute. Add in the pineapple and the shrimp that you set aside earlier, and continue to stir for about another minute. 5. Put the contents into the halved pineapple, and serve. Garnish with some fresh cilantro and / or sliced beets. Add the fish sauce, lime juice, red chili, palm sugar, and shrimp paste into a small saucepan, bring to a simmer. Add in the seafood and jalapenos. Cook for about 2 minutes, or until the seafood is cooked through. Remove from the heat, and add in the lime leaves, shallots, and onions. Prawns, peeled and cleaned 8 oz. Soy sauce or fish sauce 1 - 2 tbsp. 1. Heat oil in a saute pan or wok, then add onion pieces and bell pepper. Stirfry until hot. 2. Add prawns and toss quickly. Immediately add cucumber and tomato and pineapple. Cook everything over a very high heat. 3. Season with sugar and vinegar. 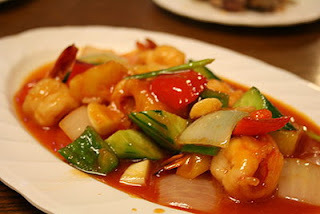 Add fish sauce or soy sauce for a touch of saltiness as this dish is usually sweet and sour. 4. 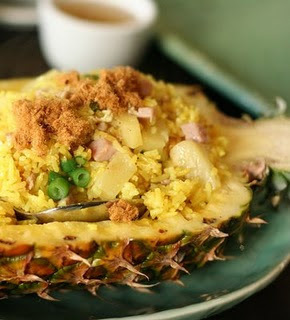 Spoon this dish onto a plate and serve hot with other main dishes. Chicken breast meat , sliced 8 oz. 1. Heat oil in a pan and as soon as it's hot add onion pieces. Cook briefly then add sliced chicken, stirfry until done. 2. 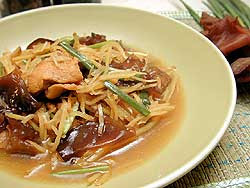 Add woodear mushrooms, ginger, two kinds of spur chili peppers and season with fish sauce and sugar. 3. Add spring onions and stir mix quickly. Spoon this stirfry onto a plate and serve. Fish sauce 2 - 3 tbsp. Ground white pepper 1 tbsp. 1. Heat oil in a wok or saute pan. While the oil is heating, beat the egg in a bowl. 2. Add the beaten eggs to the hot oil and scramble to a soft scramble stage by stirring constantly. 3. Add cold (left over) rice to the wok or saute pan and stirfry to heat up the rice and spread the scrambled egg evenly over the rice. 4. Once the rice is hot, add chopped spring onions. Toss and season with fish sauce and pepper. 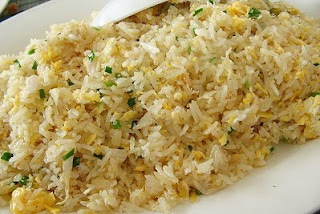 Serve this fried rice with sliced cucumber and spring onions. 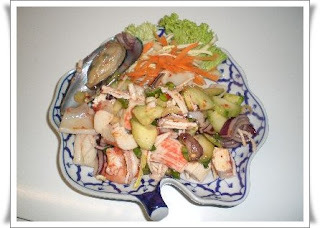 This dish usually accompanies other main dishes which are eaten Thai style. 1. Combine garlic, black pepper and coriander roots in a motar & pestle and pound well to obtain a smooth paste. 2. Wash the leeks well, cut the stems diagonally into slices about 72 cm thick and cut the leaves into 1" lengths. 3. Sauté the coriander paste over medium heat until fragrant, add the fish and stir-fry until done. Pour in the stock, stirring well. Season with oyster sauce and seasoning sauce and sprinkle pepper to taste. 4. Add the leeks and garlic bulbs, stirring to combine. Arrange on a dish, and scatter the fried garlic over the dish before serving. 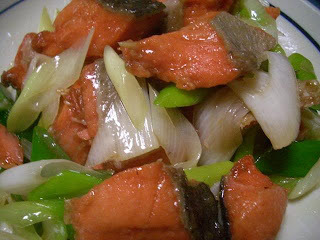 Some green leaves of the leek can be added as a garnish. For peoples who love cooking and care for health.You can help them to reach this site by link to my site by copying and pasting the HTML code from the box, onto your own blog or website. If you did it correctly, you will see this small banner show up.